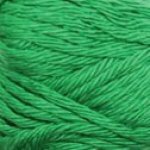 We've been searching high and low for a good quality, 100% cotton yarn for knitting and crocheting (especially for crocheting amigurumi!) that is available in a wide range of colors, and we finally discovered the wonderful Cotton Dream yarn! This is a worsted weight plied yarn, and it comes in a wonderful rainbow of colors! With 25g hanks, you don't need to purchase more than you need for those smaller projects. Cotton dream also works well as a weft yarn for your weaving projects. Washing Instructions: Machine washable warm; do not bleach. Lay flat to dry; do not tumble dry. Dry cleanable.